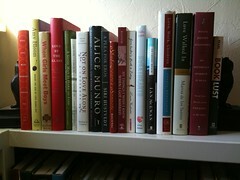 Predictably, my February bookshelf revolves around love and romance and marriage. Some are included for the titles alone — like the 1971 classic I Am So Glad You Married Me, bought for $.25 at a library book sale. And no love bookshelf can be complete without that ode to the most horrific of honeymoons – On Chesil Beach. Love is complicated. Looking forward to seeing Jane’s dedicated space…and I might need to see a picture of the “newly” arranged living room. Fun, fun. Sorry we missed you today – hope to chat soon. Miss ya. Love ya.